JUNE-AUGUST guests: we strongly encourage a Saturday to Saturday schedule. As our sole unit, this plan especially helps us effectively manage peak vacation season for the most desired travel day. Much thanks! Relax on your private oceanfront balcony to watch an Atlantic Ocean sunrise while soaking up a million dollar view. This unit is not the average tired, basic rental unit, it is our true second home and loaded with the amenities you actually want. Location: this condominium is located on the Golden Mile of Myrtle Beach, aptly named for the nearby million dollar homes. While the condo is excellent, the neighborhood is simply the best. You can afford to vacation among millionaires. Comfort: Well-equipped unit accommodates up to 6 people. Brand new designer furnishings in 2018. Murphy bed in the living room. 11 floors above ocean and direct oceanfront with private balcony. Furnishings: rent direct from owner that treats and equips this fully furnished unit as their true second home. Brand new stainless steel appliances were placed in the unit in 2018. Gorgeous granite countertops in kitchen and bathroom. Flat screen tvs in bedroom and living room. The Caravelle Resort underwent a massive makeover in 2006 and 2018, and this unique unit received new upgrades in April 2018. Free wi-fi, indoor/outdoor pools, indoor/outdoor hot tubs, lazy river, kiddie pool play area, game room, tiki bar, gift shop and breakfast available at the Santa Maria restaurant-ALL available on the property. Centrally located, minutes from the boardwalk, shopping, golf, restaurants, and nightlife. 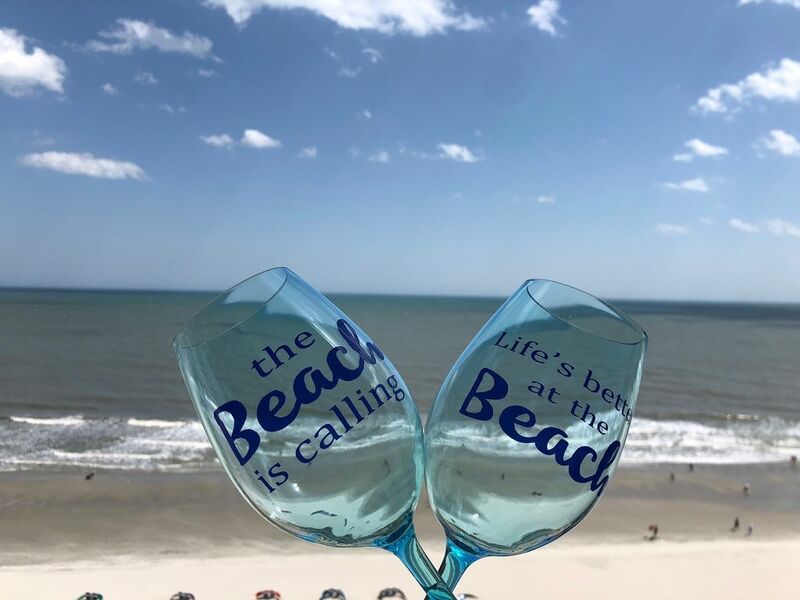 If you love the beach, great restaurants and shopping, golf, or just relaxing in general, this inviting Myrtle Beach condo is the only place to be! We grew up taking a big beach trip every summer with our families. Now that we have a young family of our own, we are living our dream: we have a fully furnished unit that we can share with others looking for a truly special trip to the beach. We love being beachfront, and this property is loaded with amenities. Once we win the lottery, this is where we will be! The view is among the best anywhere we have ever been and a primary reason we bought this unit. We've furnished and stocked the unit the way we'd want it to be. If there is a special occasion or interest, let us know: we like to live by the Golden Rule, and we can only hope our guests will be able to say this is a 5-star unit with owners that make a 5-star effort. Free local and 800 calls. With one of the finest views anywhere! We had a great time. Really liked the condo. The only thing that we found lacking was hand towels. We had wash clothes and bath towels but no hand towels. We striped the beds and they are ready to be remade. Would enjoy staying there again. We just got home from our week long family vacation in this unit! We had the best vacation ever! Erik is very responsive and super easy to work with. They made the process quick and simple. The condo is AMAZING! The view from the balcony is breathtaking. The condo is perfectly upgraded. We are a family of four with two kiddos ages 6 and 3. We had plenty of space and beds. The Caravelle offers great amenities - our kids loved the pool area. Easy beach access! We definitely plan on staying here again soon! Thank you so much for opening your condo for others to use Erik and family! From the beginning, Erik was very communicative with us which allowed a very relaxing weekend. After parking in the resort deck we opened our door by a key lockbox. We were welcomed by a very clean and inviting condo. The decor was gorgeous and made us feel at home. The beds were perfect for everyone to have their own (2 in bedroom & the murphy bed in the living room). The Apple TV was a plus for late night after a great day on the beach & at the pool. The view of the ocean was amazing from this condo. Highly recommend this rental and look forward to coming back again. Couldn’t have asked for a better transaction. Thank you again for this wonderful opportunity. The unit was just as advertised, great place for kids and families. Great location in between Myrtle and North Myrtle. The beach chairs and umbrella were awesome. Parking was kind of a pain but Good stay. Thanks. Wonderful place! The pictures on the website are accurate. My responses from Audra and Erik were always timely and helpful. We just got home yesterday and are still reveling in how relaxing this vacation was. The Caravelle resort offered all the amenities listed in the description. All in all, I'm glowing. The perfect location on the Golden Mile. Less than ten minutes to the boardwalk, but just far enough to be away from the traffic, and in an exclusive Ocean Blvd neighborhood named the Golden Mile, due to the amount of million dollar homes. The area is the most desirable for walking along the coast, yet being amongst million dollar homes. There's no place quite like it!